Before using Wercker, you need to sign in to Oracle Public Cloud and set up the Wercker service. Create an Oracle Public Cloud account. If you have not already done so, sign up for Oracle Cloud. See Manage Oracle Cloud Accounts and Services for details. Upon sign up, you will receive a Welcome to Oracle Cloud email containing access and service activation details. Once your services have been activated, you will receive another Welcome to Oracle Cloud email providing you with a link to your Oracle Cloud Account sign-in page. Sign in to your Oracle Cloud Account. The Oracle Cloud My Services Dashboard displays. Click Customize Dashboard. The dashboard service selector displays. 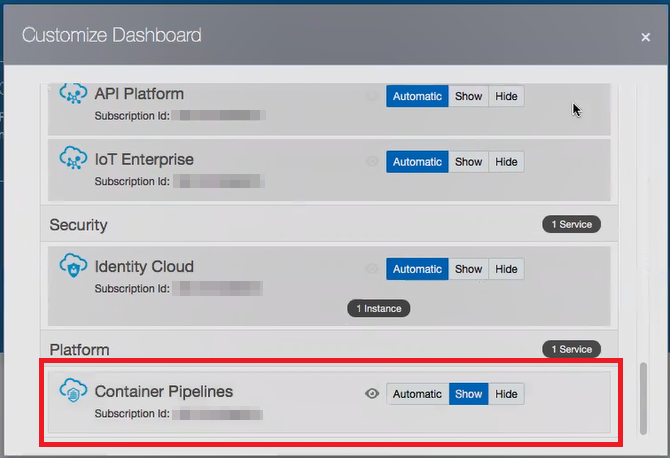 Scroll to the bottom of the service selector to the Container Pipelines service (under Platform). Click Show for the Container Pipelines service. Close the dashboard service selector. The Container Pipelines service now appears in the dashboard. From the Container Pipelines action menu, select Open Service Console to display the Wercker user creation page. Enter an Organization name. Organization names must be lower-case. Only letters and numbers are allowed. No special characters are permitted. Note: Oracle Public Cloud accounts are limited to a single Organization that has three private/exclusive runners dedicated to executing the pipeline. Click Finish. The Wercker main log in page displays.